Well, the worst is over. The helmet skull is finish-sanded, and looking good; the nasal is ready for mounting. First, I'll fit and rivet the nasal to the skull; then, put in a leather "suspension-webbing" liner. 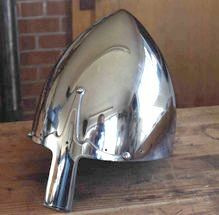 Both the helmet and nasal are taken up to a nice shiny finish with a white "stainless steel" buffing compound. 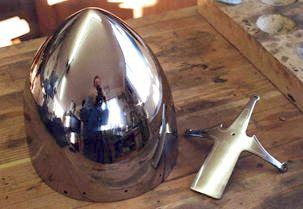 I took a picture at this stage since this is as good as the finish will get; now I am starting assembly, and the helmet will be handled and knocked about some, dulling and scratching the finish slightly. With the nasal mounted, I'll never be able to buff the helmet skull so evenly again. Yes, that's me, reflected in the helmet skull as I take the picture! I rivet the nasal on first, before putting in the lining. This is necessary, because a brow band rivet is going to go through the 1/8" hole you see in the center of the nasal. I thought long and hard about what sort of liner to put in this helmet. As far as I know, no examples of helmet lining or padding survive from this helmet's era. Authorities speculate. 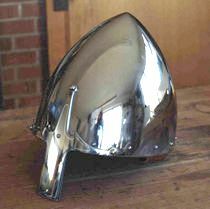 The Osprey Warrior Series #1, "Norman Knight", by Christopher Gravett, takes a shot at reconstructing several parts of 11th century equipment, and in Plate D shows a hypothetical helmet lining. 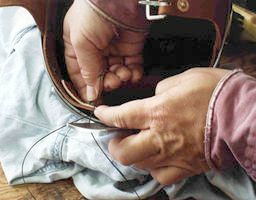 "Wedges" or "gores" of fabric or leather are stuffed with padding (horsehair, tow, etc) and stitched to the bottom edge of a tough leather band that is riveted to the bottom rim of the helmet skull. Fair enough. But it occurred to me: if the wearer of this helmet also wore a padded cloth headpiece, and a mail coif over that, further padding in the lining would seem to be a bit redundant. Period illustrations exits that show warriors with their helmets off, revealing considerable padded headpieces. With the finished rim of this helmet being about 9.25" by 7.75", a person with an average-sized head would quickly run out of room. (Granted, I may have made the skull a bit too small, but the proportions looked right, to me.) Maybe it went like this: early Medieval helmets were worn over padded headgear that was tied separately to the head. By the 14th and 15th centuries, padding was nailed or sewn to the inside of the helmet instead, and the wearer pulled the helmet on over his bare head -- or perhaps he wore a thin fabric headpiece. So, I decided on a variation. 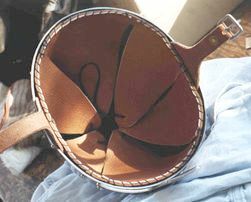 I would put in a suspension-type leather liner, made of six gores, and stitched to a brow band. 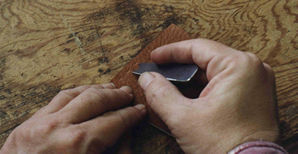 The gores, however, would be cut from only one layer of very supple leather, and not padded. This type of liner would (I hoped) make a comfortable fit over layered cloth-and-mail headgear. I cut out the elements for a leather suspension lining. 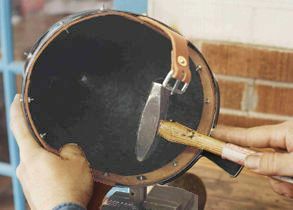 Six "gores", of a supple "baseball-glove" type leather, are cut, along with a band of tough, belt-weight leather for the fastening band that will be riveted to the rim of the helmet. 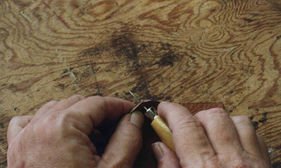 A couple of tools are also shown: a small two-prong pricker to mark the sewing holes for the lining, and a very sharp stitching awl. 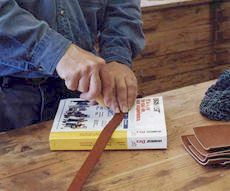 Phone books are great as backing for punching with awls. Using the awl, I punch the sewing holes. The holes are spaced 3/8" apart. This may seem a big distance between holes, but the gores will be held by a rough-and-ready whipstitch with very heavy thread, so the big stitches will not seem out of place. I've already marked and punched the 1/8" holes for the rivets that will hold the band in place. I sew the ends of the brow band together with a few stitches of heavy waxed linen thread. I cut out and punch the two halves of the chinstrap. I made the simple buckle out of steel, punching it out of 12 gauge plate, and filing it to size; the tongue is a 14-gauge snippet. 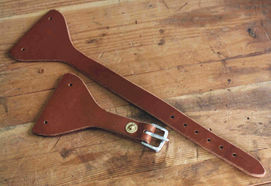 A commercial brass rivet, reinforced with two handmade brass washers, secures the buckle. The two rivet holes in each strap are set so that the strap, when fixed in the helmet, will be canted a few degrees forward, to fit better under the wearer's chin. This is a wild guess as to what an 11th century chinstrap would look like. What did the period ones look like? Did they tie, or buckle? Search me! The scholars still debate. 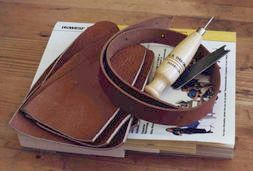 But the straps shown above would be well within an 11th-century leatherworker's capability. I rivet the brow band inside the helmet. Machine screws hold the band in place; I just take one screw out at a time, replacing with a 1/8" rivet. The washers are period type: thin (26 gauge) steel, crudely snipped out of a scrap piece, and pierced with a punch. (I imagine washer manufacture was mostly done by child labor, in period.) Note the chinstrap halves: they go underneath the band on the sides. Using the same 3/8" two-prong pricker that I used to mark the stitch holes on the brow band (which process I did not illustrate), I mark stitches on a gore. I then pierce the holes in the gore with the sewing awl. 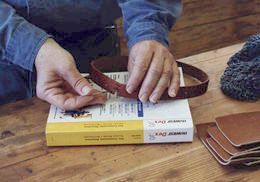 In theory, the leather needles I use are sharp enough to pierce leather without needing a pre-pierced hole, but the awl makes sewing much easier. I whipstitch the gores, six of them, into the helmet. I use a curved leather needle and heavy waxed linen thread. The holes in the brow band are on the bottom of the band, near the helmet rim. This means that the gores will cover the rivet ends when sewn in, a comforting feature. The liner, fully installed. I punch each gore with a single 1/8" hole near its peak, and thread a heavy bootlace through all the holes, pulling the gores together until I get a span that fits my head comfortably. Then I tie a knot in the lace. The finished product. Final weight, all accessories installed: 4 lbs 14 oz.